It’s that time of year again. Every Spring I try to make a new work for the NIAD’s annual benefit. This helps me experiment with new materials which often spawns ideas for upcoming series. 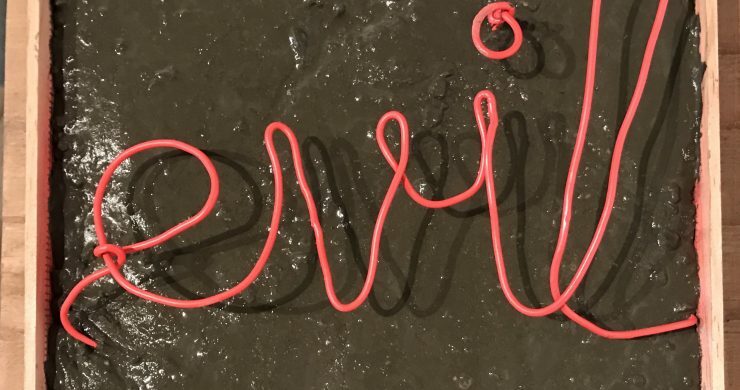 Here I created ‘Evil’, a painted, wired word piece. The wire is gripped and screwed beneath a layer of concrete on a wood frame. In June, I will be having a small solo show at NIAD. I’m thinking of calling it Medieval Modern. A modern rehashing and manupulation of all things medieval.